I swear I still cook, I've just been doing a lot of repeats lately so I don't have much in the way of original ideas to post. 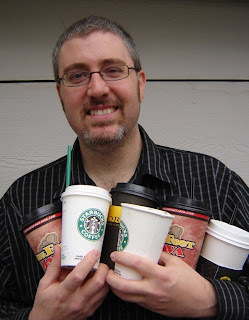 That said, the boy and I decided we were tired of the standard Puget Sound-style drive-thru coffee-stand breakfasts (as you can see, we're BAD about that!) and we decided to venture out for some "real" breakfast food. We decided to do Sunday Brunch at "Quickie Too" over in Tacoma, and as always, the food ROCKED! 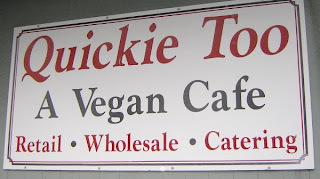 Quickie Too is an all-vegan cafe owned by the same people who have Hillside Quickie and Hillside Quickie Sandwich Shop in Seattle. They call their food Vegan American-Soul Fusion which pretty much translates into GOOD! If you're ever in Seattle, or Tacoma, check them out! 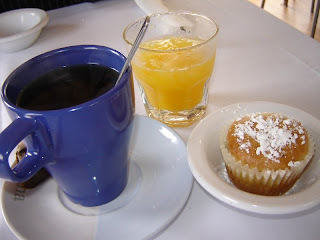 We started with these incredible melt-in-your-mouth blueberry muffins, tea and fresh-squeezed orange juice. Totally tasted as good as it looks! I'm serious, ALL of that!! And even though we've been here before, we dug in so fast, we didn't THINK to take a picture, it was that good. Hope you all had a restful, enjoyable weekend. why, oh why, is Tacoma 3000 miles away? I'd go the distance for a rocking vegan brunch! Sounds great! A real southern-style breakfast. Wow, looks awesome. Hope to go there some day before too long!